I hope everyone had a great Spring Break week whether you stayed at home or traveled. 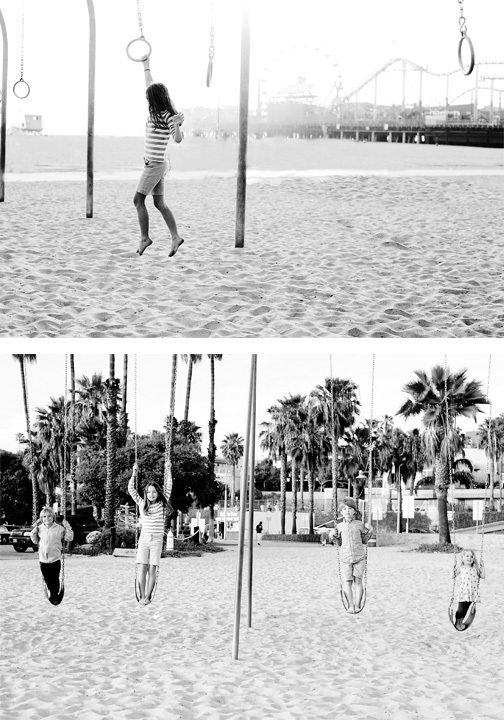 We were fortunate enough to be able to spend some time with the family in Palm Springs and Santa Monica, and what a great trip it was! I actually surfed too but will save you from the pics of me in a wet suit (and busting it too many times to count).. Okay, I know I may lose some of you on this post, and I get that. 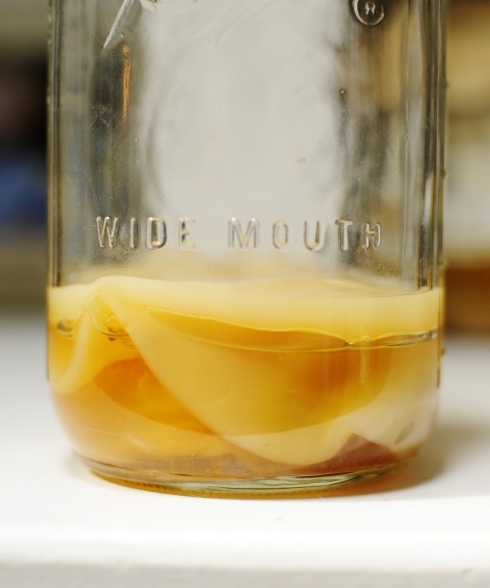 The process of making kombucha, can be a bit…gross, and so it took me years to finally take the plunge. Getting to the point of making something as peculiar as kombucha was an evolution for me. It started with cooking whole healthy foods, then moved to up to making my own bone broth, and well, I’ve since graduated to making kombucha. As some of you may know, I won’t make something unless it’s pretty simple, and well, this is really simple to make!! 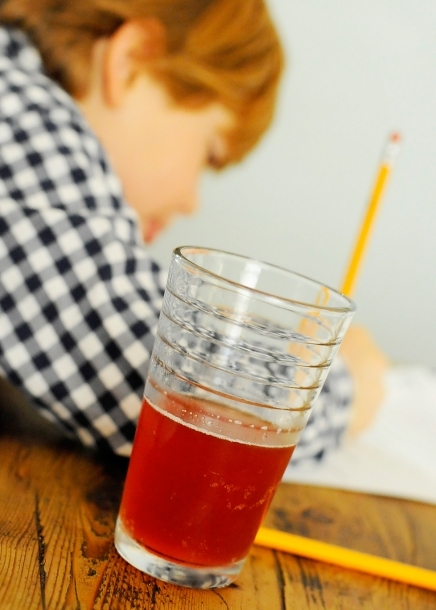 Here and here are some more detailed benefits of kombucha. Needless to say, I was ecstatic when he said he “LOOOOOVED” his new drink. He actually said, “it tastes better than Sprite, mom!”. 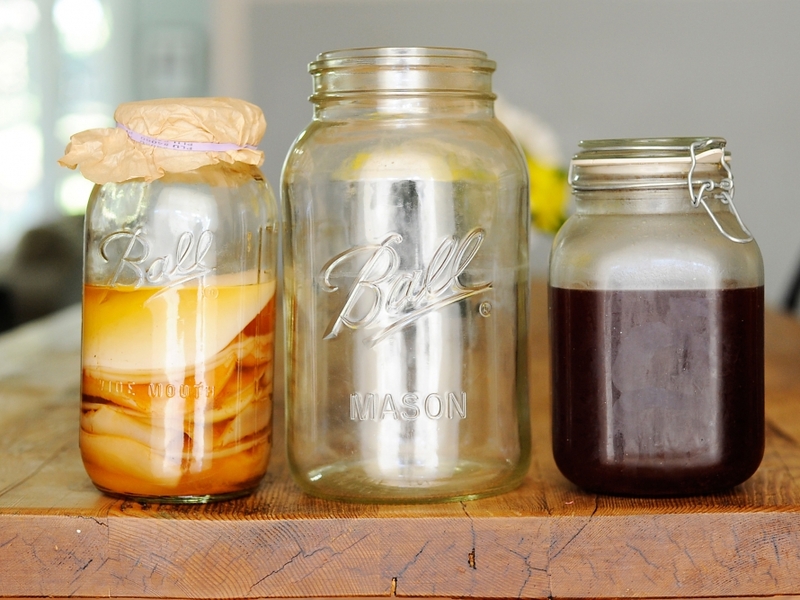 In order to make kombucha, you need is SCOBY. You can either get one online from Cultures for Life, you can make one, or you can come get one of mine if you’re in Atlanta (I have about 10 so I’m happy to share)!! First come first serve! I like the tall bottles (far right) best for storage since they help save space in my already overstuffed refrigerator. Start by bringing 6 cups of distilled water to a boil. Once it boils, turn the stove off and add 1 cup of sugar. Stir well until dissolved. Then add 8 tea bags and let it seep for 12 minutes. Here is a list of teas and a post from FoodBabe if you need some guidance on which tea to use for your kombucha. Then add the additional 6 cups of cold water and allow to cool for at least 10 minutes in the refrigerator or 25 or so on the counter top. Pour your tea into the gallon jar. Then, add 1 1/2 cup distilled white vinegar or store-bought unflavored, unpasteurized kombucha or if you have some, use starter kombucha (from the half gallon jar with your scoby from your “scoby hotel”). Next, with your freshly washed hands, add your scoby to the tea. Cover the jar with a coffee filter and rubber band and allow to sit for approximately 2 weeks in the winter (somewhere it can get some sunlight inside the house) or about 7 days in the summer. During the week or two of fermentation, a new scoby with evolve on the top of your tea (see below). Once it’s at least 1/4 inch thick, it’s ready to add the finishing touches. 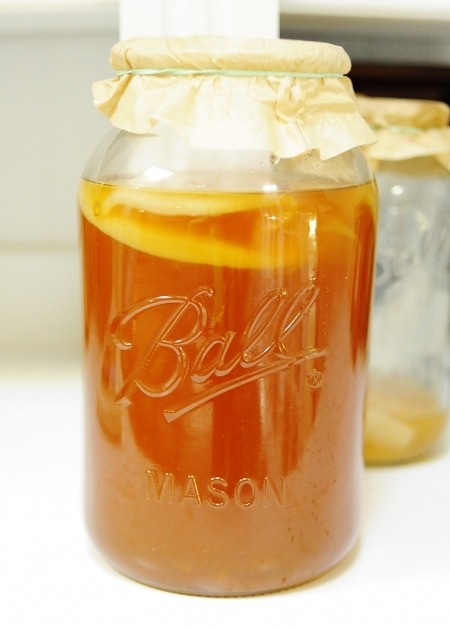 Take the scoby out and move it to the half gallon jar and pour about half a cup of the tea from the gallon jar. Cover with coffee filter and rubber band and store it on your counter. I know, it’s not the prettiest counter-top decoration but it certainly is a conversation starter. Now, with the rest of your tea (from gallon jar), pour it into smaller bottles or glass containers (see above) and add your juice. We like the taste of pomegranate juice or the anti-inflammatory properties of tart cherry juice. Everyone’s taste buds are different but we usually use about 1 cup of juice or enough to let the kombucha equal to approximately 10% juice and 90% tea. You could also add a handful of fresh berries if you’d like. My next batch I am going to try using a handful of strawberries and a few slices of lemon. Sounds good, doesn’t it? Anyway, allow it to sit and brew with the lid on for another 1-3 weeks (the longer it sits, the more fizzy it will be) and then you are good to go! Now…you’re done. I promise, it gets easier and easier each time you make it and honestly, besides the boiling, seeping and cooling, and fermenting time, it’s only about 5 minutes of actual work. See, I told you it was easy!! Look at that thing. It makes me so happy!! 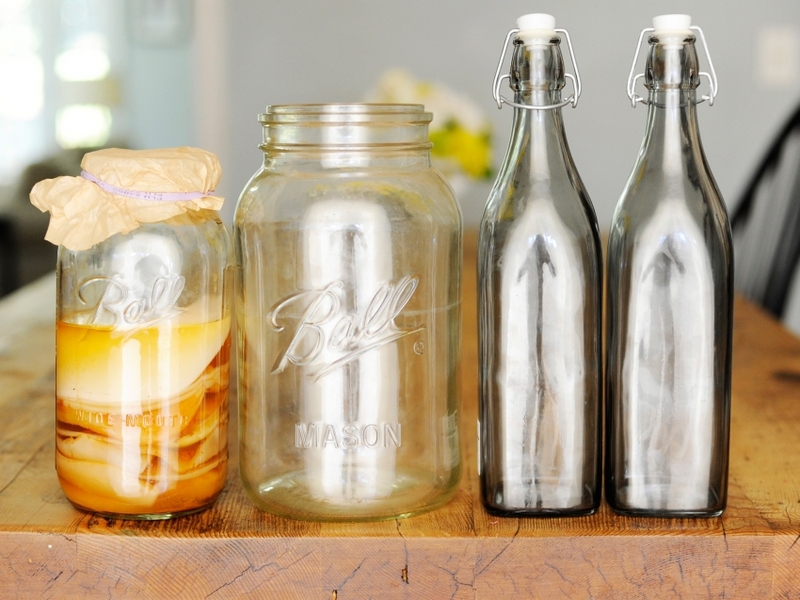 I also have used the larger wide mouth jars (see far right) for storing my kombucha. I got my glass jars from Target since they have so many different options. Go for it! Continue that food evolution and enjoy a fabulous tasting and super healthy drink! 1 1/2 cup distilled white vinegar or some store bought unflavored unpasteurized kombucha (for the first batch). Use the kombucha from your scoby hotel from here on so be sure to always add extra to your scobys before you move the the second ferment (with the tall bottles). Combine hot water and sugar in a glass jar. The water should be hot enough to steep the tea but does not have to be boiling. 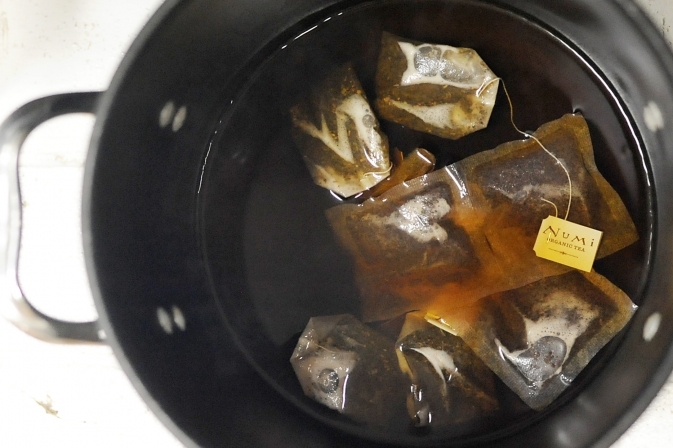 Place the tea bags in the sugar water to steep for 12 or so minutes. Cool the mixture to 68-85ºF. Remove the tea bags from the liquid. Pour into your gallon glass jar. Add starter tea from a previous batch to the liquid. If you do not have starter tea, distilled white vinegar OR some kombucha from the store that is unflavored and unpasteurized may be substituted. Cover the jar with a coffee filter and secure with a rubber band. 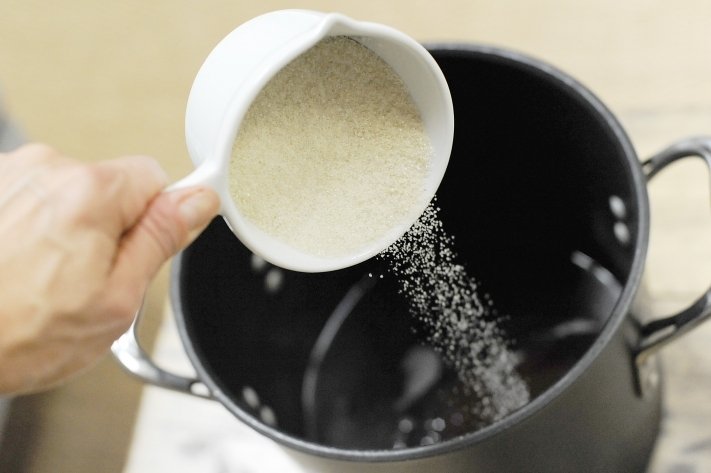 Allow the mixture to sit somewhere in the house where it can get some sunlight for 7-14 days, or to taste. The longer the kombucha ferments, the less sweet and more vinegary it will taste. Take the scoby and put it in the half gallon jar and add some tea to it (about 1/2 cup) to use as starter tea for the next batch. Pour the rest of the tea into your glass jar or bottle and add juice (to taste), if desired. Allow to sit or brew for another week or so (the longer it ferments the more fizzy it will get) and then enjoy! Courtney Ward - Love Kombucha! We recently moved and my scoby(s) didn’t make the trip with us. I would love to get a Scoby from you to start another batch going! Charlotte - So this will go on my aspirational cooking list – maybe when baseball season is over! So for the very time strapped , can you recommend a brand/flavor that you like that I can buy at Whole Foods?